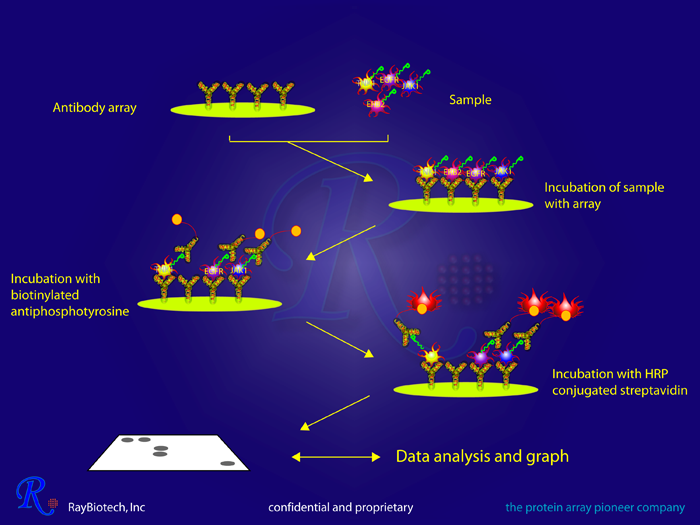 The RayBio® Human RTK Phosphorylation Antibody Array is a rapid, convenient and sensitive assay for simultaneous detection of phosphorylation of 71 different human tyrosine kinase receptors (RTKs). This assay allows the researcher to monitor pathway activation in cells or tissues without the excess time and effort of immunoprecipitation or Western blot. The Human RTK Phosphorylation Array is spotted with a panel of 71 RTK-specific antibodies to capture the tyrosine kinases of interest. A biotinylated anti-phosphotyrosine antibody is then utilized to detect relative levels of activation in each captured protein. The array signals can be developed by chemiluminescence (membrane-based format), or fluorescence (glass slide-based format). For a comparison & overview of all phosphorylation assays, click here. After a blocking step, treated or untreated cell lysate is added into antibody array (either membrane or glass slide). The arrays are washed and biotinylated anti-phosphotyrosine antibody is added. After incubation with streptavidin-conjugated HRP or fluor, the signals are then visualized by chemiluminescence or fluorescence imaging system. If you do not have access to a scanner, RayBiotech provides slide scanning and data analysis services. Metastasis-focused cell-based SELEX generates aptamers inhibiting cell migration and invasion. Int J Cancer. 2011 15 February;128(4):797?804.